I’ve been eating raw corn. This summer the fresh corn has been so tender that sometimes I haven’t even bothered to cook it. The ears I bought this week were a different story. The cooler weather is giving the kernels a tougher exterior. The corn isn’t as sweet as it was a month ago, either. Instead of giving up on corn for the year, I’ve given up eating it raw. I’m messing with it more than I did when it was tender. I sauté it with green beans or roast it for salsa. I turn it into corn pudding. I’ll be serving a lot more corn pudding now that I figured out how to make it in small batches in 15 minutes or less, including cutting the corn from the cob. This isn’t your mama’s corn pudding. The texture is so light and airy it tastes almost whipped. 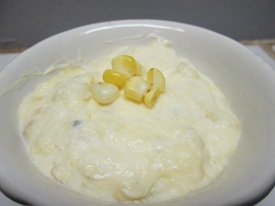 The corn pudding is thickened with cornstarch and microwaved. It is enriched with egg yolk stirred in near the end of the cooking time to prevent it from curdling. Fresh from the microwave, a bit of butter and shredded pepper Jack cheese are added and given time to melt before pouring the pudding into custard cups for cooling. If you’re in a hurry you can cool it in the freezer for about 20 to 30 minutes before serving. The pudding thickens as it cools. It tastes even better than raw corn, and is just a tiny bit more trouble. Place corn kernels in a 2-cup glass measure, cover with plastic wrap and microwave on high power for 1 minute, until corn is tender. Remove from oven and stir in sugar, cornstarch, flour, salt and pepper. Stir in the half and half or milk and beat with a fork until smooth. Microwave on high power for about 2 minutes or until the mixture boils and rises to the top of the mug. Remove from oven and gently stir. Do not stir rapidly or the pudding will become watery as it cools. Slowly drizzle, drop by drop, about 4 tablespoons of the hot mixture over the egg yolks in a custard cup, beating rapidly to prevent egg from curdling. With a rubber spatula scrape egg mixture into the pudding mixture in mug and stir slowly but thoroughly. Microwave on high power for about 25 seconds or until custard just starts to boil. Add butter and and cheese and let stand for 2 minutes to melt. Stir gently. Pour into 3 or 4 custard cups. Place in freezer for about 30 minutes, until pudding is set but still warm. Serve warm or chilled. Check out my recipe for a killer tomato tart in From Garden to Table, my new eating-fresh blog on HGExpo the Online Home & Garden Show’s website (http://www.hgexpo.com/blog/garden-to-table-savory-tomato-tart.html). Last week I was up to my patootie in heirloom tomatoes and there was a half container of ricotta cheese in the refrigerator. So I lined a tart shell with a ricotta-herb custard and layered slices of tomato over it before baking. What a way to eat tomatoes. Mmmm. You can’t beat the price of the weekly four-course tasting menu at Vaccaro’s Trattoria in Bath Township. Every Wednesday and Thursday evening the Italian restaurant offers a chef’s menu or four courses PLUS four wines for $35. What a bargain. The only rule is you must reserve in advance by phoning 330-666-6158. Janie girl, I gave you that jar of Uncle Gizzy’s Horseradish. I buy it from Uncle Gizzy at the Hartville Flea Market. When in season, he has a table under the outdoor produce concourse. It’s the BEST! Dear Michele: Thanks for jogging my memory. It IS good horseradish. Thank you for the gift, in case I forgot that, too. Uncle Gizzy’s Horseradish is sold at flea markets. I’ve seen it at Four Seasons on Sundays in Campbell, which is on Route 422 near Youngstown and at Jamie’s on Saturdays in South Amherst, Ohio. I’m not sure if they set up at Hartville. They used to set up regularly but I’ve noticed lately that they are not there every flea market day. I spoke to the vendor and got a phone number: 330-524-4240. He will soon be heading for Clearwater, Fla., so P.M. needs to get in touch with him ASAP. Dear Jean: That was so nice of you! Thanks. She would cut the round steak into about six pieces, the original about three-fourths-inch thick. She would then pound flour, salt and pepper into it with a knife. (I use an aluminum tenderizer.) My aunt used the edge of a saucer to produce something akin to cubed steak but with the flour imbedded into it. You then sauté in butter to brown it and be careful not to overcook. It turns an economical cut into a treat. I would say that this is the basis for country fried steak. In our family this was especially wonderful in spring with a nice mess of morels on the side of course also sautéed in butter. Real butter, not margarine. A tip of the hat to our Belgian heritage that makes a sacrament out of butter. Dear Janet: Years ago round steak was an inexpensive cut that many cooks (including my mom) turned into Swiss steak. The meat was pounded with flour and salt and braised in liquid (usually water) for a couple of hours, until tender. We used vegetable oil, not butter, and at my parents’ house the mushrooms came from a can. I like your version much, much better.If round steak was less expensive I’d try it. But I’ll be darned if I’ll pay $5 a pound for a tough piece of meat. From Joan: I’m serving breakfast to several friends and plan to serve crepes stuffed with ricotta cheese and topped with blueberries. What would you serve with this menu? I plan to have some kind of meat — bacon, sausage or ham. Any ideas? Love your emails. Thanks loads. Dear Joan: I’d make a big pile of bacon because who doesn’t like bacon? Bake it on a cookie sheet at 400 degrees for about 20 minutes. Also, offer a platter of cut-up fruit, a bowl of Greek yogurt and another bowl of homemade granola. The crepes are pretty substantial, so I’d go fairly light with the rest. Another idea: Eggs gently scrambled with smoked salmon and chives, lightened near the end of cooking with a spoonful of sour cream. Breakfast is a great way to entertain, isn’t it? I’m serving breakfast to several friends and plan to serve crepes stuffed with ricotta cheese and topped with blueberries. What would you serve with this menu? I plan to have some kind of meat — bacon, sausage or ham. Any ideas? Love your emails. Thanks loads. Dear Joan: I’d make a big pile of bacon because who doesn’t like bacon? Bake it on a cookie sheet at 400 degrees for about 20 minutes. Also, offer a platter of cut-up fruit, a bowl of Greek yogurt and another bowl of homemade granola. The crepes are pretty substantial, so I’d go fairly light with the rest. Another idea: Eggs gently scrambled with smoked salmon and chives, lightened near the end of cooking with a spoonful of sour cream. Breakfast is a great way to entertain, isn’t it?